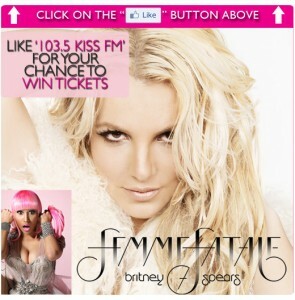 Enter To Win Britney Spears' Chicago Concert Tickets From 103.5 KISS FM Through 7/5 | A Savings WOW! “Like” 103.5 KISS FM’s Facebook page to enter for a chance to win a pair of front row tickets to check out Britney Spears and Nicki Minaj LIVE at the United Center July 8th and a pair of passes to meet Britney backstage! All from Jive Records and 103.5 KISS FM! Enter through July 5th. While you are on Facebook, please visit A Savings WOW!’s Facebook page.